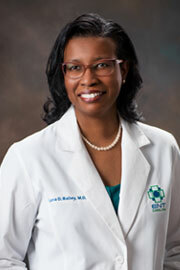 Luna D. Bailey, MD, grew up in the US Virgin Islands and received her undergraduate degree from Duke University in Durham, North Carolina. She attended medical school at the University of Buffalo where she was the recipient of the Dean's Award and inducted into the Alpha Omega Alpha Medical Honor Society. Dr. Bailey completed her surgical internship and residency at the University of Buffalo and then transferred to the NY Eye and Ear Infirmary in Manhattan in 2001. After completing her residency in New York City, she spent time in Phoenix working on reservations with Native American patients before returning to the Carolinas. Dr. Bailey is certified by the American Board of Otolaryngology and is a fellow of the American Academy of Otolaryngic Allergy. She specializes in General Otolaryngology-Head and Neck Surgery and believes in a personalized approach in caring for both pediatric and adult patients with ear infections, allergies, nasal/sinus problems, tonsillitis and many common ear, nose, and throat conditions. Dr. Bailey serves with Dream Ministries, a local mission team from Shelby, NC and performs surgery in the Dominican Republic for primarily pediatric patients who would otherwise not be able to have surgery. She loves spending time with her family and friends along with growing her Christian faith. She enjoys cake decorating as a creative outlet from medicine and owns a custom cake business.